Today, digitization penetrates all spheres of business. 2.5 quintillion bytes of data that people create every day is predominantly unstructured data. Whether it is audio, video or text, big data – if meticulously collected, recognized and processed – can be used to generate business value through leveraging state-of-the-art technologies. But no matter how intelligent machines may be, they aren’t capable of absorbing and interpreting information the way humans do via senses. For training machine learning and deep learning algorithms, the data is needed in digitized form. So, AI-based solutions could process and comprehend it. Automated data capture involves using technologies that allow machines to capture data and then transform it into meaningful insights. The choice of automated data capture methods depends on the type of business and strategic goals. Here are the examples that demonstrate the key role of big data for business to flourish. OCR, OMR, ICR: What Is the Difference? Optical character recognition (OCR) is a well-established and proven technology. Once the technology has disrupted the traditional approach to document management, it remains as relevant as ever. As a perfect solution for digitizing massive amounts of paper and electronic documents, it is widely applied across such areas as logistics, healthcare, finance, banking, governing, and more. Multipurpose OCR systems effectively reduce the costs of capturing data, automate routine manual tasks and take over for human employees in repetitive tasks. 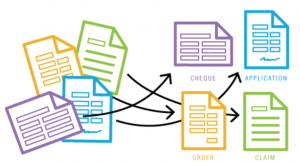 Although output requires human reviewing – especially while working with legal documents and financial reports – the solution is a prerequisite to ensure cost-efficient document management. Statistics reaffirm the technology’s effectiveness. 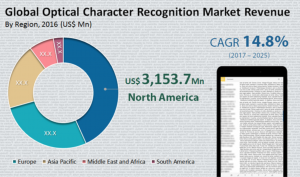 By the year 2025, the global OCR market is predicted to become worth over 25.000$. It will be 14.8% more than in 2017. The number of adopters is the largest for North America and then for Europe. Another approach to managing documents is optical mark recognition (OMR). The technology is commonly used to accelerate and facilitate capturing human-marked data. Such are, for instance, the results of polls, multiple choice tests, consumer feedback or surveys. After scanning the documents, the algorithm detects the location and recognizes hand-written marks many times faster than human employees. The tech-based approach enables completing routine tasks by machines in time- and resource-efficient manner and fosters business workflow automation. The last out of the three is intelligent character recognition (ICR) aimed at solving more sophisticated challenges. The technology allows teaching machines to process raw hand-written documents. Depending on various fonts and styles, block letters or cursive handwriting, the level of accuracy may vary from 50% to 70%. This rate can be improved through further training the algorithm on rich datasets of specific data. Complex business processes generate volumes of unstructured documents, i.e., in the finance and logistics industry. IDR allows extracting data from any part of a document, including meta description. The technology incorporates optical character recognition but also enhances the capabilities of OCR. It is capable of interpreting patterns, tables, and content in both paper and electronic formats, recognizing the beginning and end of documents, and sort them by categories accordingly. After that, any required data can be extracted and prepared for storing in a database or using into business apps. 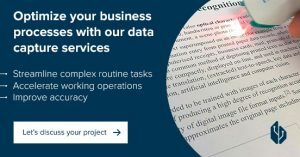 To illustrate, IBM Watson has recently made an IDR-driven feature for working with business and governing documents generally available. Such business solutions are most sought after these days since they assist in mitigating risks and cut time and costs to unearth maximum valuable data and uncover new business perspectives. Automated data capture can be conducted via different systems since by definition data occurs in multiple formats, e.g., being encrypted into QR codes. The number of related use cases in retail and in-store payment is skyrocketing. Industry leaders like Walmart, Starbucks, and Amazon turned the technology into a novel solution for capturing data on merchandises and making payments. Amazon Go is predicted to change the traditional way of shopping. Each visitor is instructed to download the app and scan the provided QR code at the entrance to make purchases in a checkout-free store. It is just one of the data capture methods used to power the scan-and-go system. To promote coffee roast and let coffee lovers learn more about favorite beverages, Starbucks places QR codes around in-store locations and on fliers inviting consumers to scan a code and get redirected to coffee products information, including expert’s opinion or even music of the region where coffee was grown. The US largest retailer, Walmart uses QR codes to enable self-servicing. In large shopping facilities, several in-store registers allow customers to scan the code through a mobile app and pay for purchases using their smartphones. 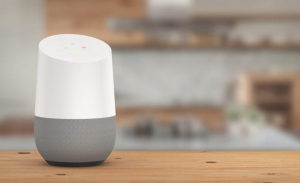 By 2020, voice search is expected to be 50% of all web searches, according to Econsultancy. Voice assistants as Google Assistant, Siri, Alexa, Cortana has natural language processing (NLP) technology under the hood. Simple “Hey Google” or “Alexa” awake the system to decipher the command and then obey it or generate an answer. Leading-edge NLP approaches are based on deep learning algorithms that require huge amounts of labeled data to recognize and understand voice patterns, to digitize human speech and process big data to react in a human-like way. Apart from such popular areas of technology implementation as interpreting, support services, marketing or security, NLP can be embedded in electronic data capture systems. Such solutions help aggregate clinical trial data or patient data that can be entered manually or by voice. 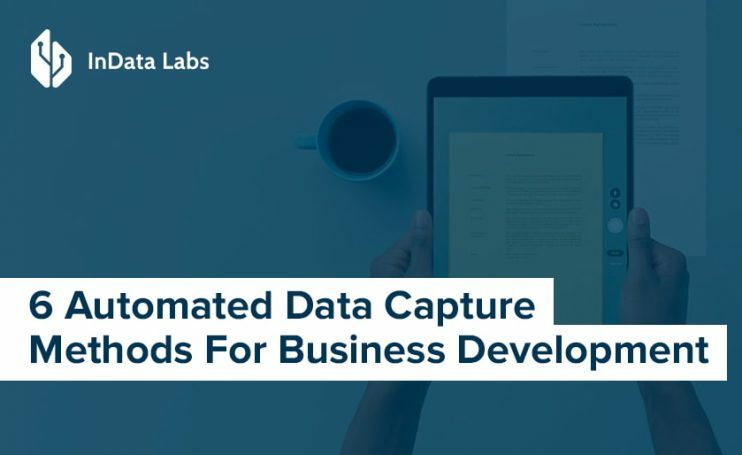 Among the benefits of automated data capture are time-saving and cost-effective approaches to data collection and processing with little to no human involvement, expedited ways to retrieve insight and predict risks or uncover perspectives, improved consumer experience, facilitated search, and more. As for disadvantages, automated data capture processes aren’t faultless, but the error rate is continually improving. Businesses of any sorts need adopting a way of gathering and processing big data. Cooperating with a reliable automated data capture provider, they can become owners of top-tier solutions that meet niche-specific requirements. It is exactly the key to success in a highly competitive today’s market.